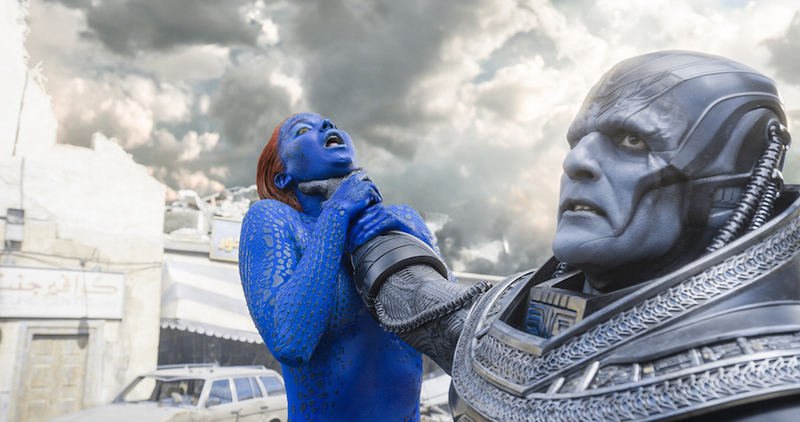 Apocalypse includes everything you&apos;d want in an X-Men 2016, including two of the best superhero set-pieces ever. But after Days Of Future Past, it feels a tad underwhelming, and even a little tired. Over the last 16 years, Bryan Singer has established himself as the quintessential superhero director. Yes, even more so than Christopher Nolan, Sam Raimi, and any of Kevin Feige’s cronies, as he has been able to combine gravitas with subtle themes that rise to prominence in the X-Men saga, all in an entertaining, ambitious and truly cinematic style. 2000’s X-Men and 2003’s X2 helped to both legitimize and kick-start the comic-book boom, while 2014’s X-Men: Days Of Future Past eclipsed both of them and is right up there as one of the finest ever entries to the genre. So when I say that X-Men: Apocalypse is Singer&apos;s worst effort in the series to date (but still obviously better than Last Stand, and even First Class or any of the Wolverine films), that’s only because of how scintillating his previous efforts were. Apocalypse is also still resoundingly entertaining. But it ultimately lacks the cohesion and energy of Days Of Future Past. It tries to juggle too many plots and subplots, including introducing us to younger versions of characters we’d previously met and adored over a decade ago. Plus, some of its apocalyptic action even brought on a touch of the dreaded superhero fatigue. X-Men: Apocalypse primarily takes place in 1983, but it begins in ancient Egypt where Oscar Isaac’s En Sabah Nur/Apocalypse, the world’s first mutant, looks to merge with Celestial technology to become even more powerful. His augmentation is sabotaged, though, which results in him being trapped for centuries. When Apocalypse finally is released from his slumber, he is disgusted by the world, acquires four followers, and sets out to change things. Charles Xavier (James McAvoy) has an issue with that, and alongside Raven (Jennifer Lawrence), and an array of younger X-Men, including Cyclops (Tye Sheridan), Jean Grey (Sophie Turner), Quicksilver (Evan Peters), and Nightcrawler (Kodi Smit-McPhee), he looks to stop them. As you’d expect from Bryan Singer and screenwriter Simon Kinberg, Apocalypse gets down to business in an economic, pacey and riveting fashion, establishing its titular villain, the new posse of younger superheroes, as well as the current plights of Magneto, Professor X, and Mystique, and setting up the conflicts that are about to unfold in a funny, compelling and eye-catching manner. But after its opening act, Apocalypse never pushes on or becomes more potent, with the sight of Oscar Issac’s Apocalypse traveling to pick up Olivia Munn’s Psylocke, Alexandra Shipp’s Storm, Ben Hardy’s Angel, and Michael Fassbender’s Magneto being more plodding rather than enthralling. Unfortunately, Isaac’s Apocalypse is similar to Tom Hardy’s Bane (rather than Heath Ledger’s Joker), as he’s just brawn, brute, monosyllabic and rather dull. Overwhelmed by make-up and his costume, Isaac is unable to deploy any of the personality, charisma, or complexity that has made him one of the most in-demand actors in American cinema, while the final sequence is too reminiscent of other battles from the series to strike a chord. There’s just too much grandstanding, and it feels like you’re watching a WWE stand-off. The established ensemble all excel, though, with Michael Fassbender giving Magneto a Shakespearian poise, while James McAvoy has never looked more comfortable as Professor X. The new additions merge into the world seamlessly, too, teasing that the franchise’s future is in safe hands. My only concern is that while Marvel have been able to, mostly, build their universe chronologically, X-Men&apos;s decision to go back in time with First Class means that the franchise is becoming convoluted. Not only are they re-treading old ground, but they&apos;re pushing the most engaging pair from the series, Charles Xavier and Magneto, more to the sidelines. But there&apos;s still more than enough to make X-Men 2016 : Apocalypse captivating, as it features three scintillating action sequences that are right up there with the best the franchise has ever produced. The opening in Ancient Egypt is immediately rousing, while Apocalypse somehow manages to top Days Of Future Past’s Quicksilver set-piece, and I won’t go into the other in any detail whatsoever for fear of spoiling it. All I will say is it will have you leaping off your seat with joy. Along the way, Bryan Singer controls the camera in a smooth and silky manner, while including detailed human touches to the action and the X-Men’s use of their powers that get under your skin and are striking to see. Once again, he manages to combine the storytelling of the Marvel Cinematic Universe with the spectacle of DC, as he uses colors, silences, pans, and a mixture of intimate and grandiose framing to create a cinematic texture that&apos;s just intoxicating. But, after Days Of Future Past, you’ll be left feeling a little underwhelmed by Apocalypse, as there’s only so many times that you can watch the world being brought to the edge of obliteration. X-Men 2016: Apocalypse still works and entertains, but not quite as emphatically as it predecessors, and it’s proof that bigger and louder is not all always better.